Were the ancient cities of Sodom and Gomorrah destroyed by atomic bombs? Does ancient Indian Vedic literature record nuclear warfare thousands of years ago? Many authors say yes, but does the evidence stand up to scrutiny? 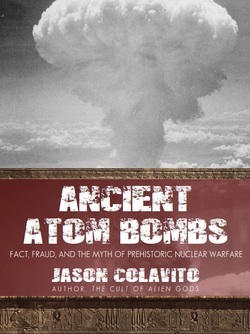 For more than a decade, Jason Colavito has investigated claims of ancient atomic warfare. Now, in a new investigation Colavito critically examines the ancient Vedic texts to show exactly how "alternative history" authors like Erich von Daniken and David Hatcher Childress use misleading quotations and sloppy scholarship to essentially invent atomic wars that never happened. This brief eBook dares to ask the question: Ancient atom bombs--yes or no? This free 25-page eBook is available for download as a formatted PDF file, or as a .mobi file for the Amazon Kindle and smartphones. If you enjoyed this eBook, please share it.